The TCK workers’ retreat in Thailand went really well. There were only 6 people, but the small size gave us some flexibility. I had wondered if there was enough “content” but was committed to making it a restful experience. Looking back I’m glad the time was not more structured and that the sessions were so casual. I feel like we had some productive discussions but also, more importantly, created a restful and enjoyable space away from ministry responsibilities. On the second full day of the retreat we all went out as a group. It was bright and sunny for the first time, and we hired mopeds (4 between 6 people) and drove up the coast. The weather was perfect. We planned to stop at a restaurant by a beach 10km from “home” which Christina and I had visited in June. That visit was made necessary when one of the mopeds got a flat tyre. We had drinks, held our morning session there, then swam in the ocean til lunchtime. The water was perfect and we came in just as a storm began to blow in overhead. 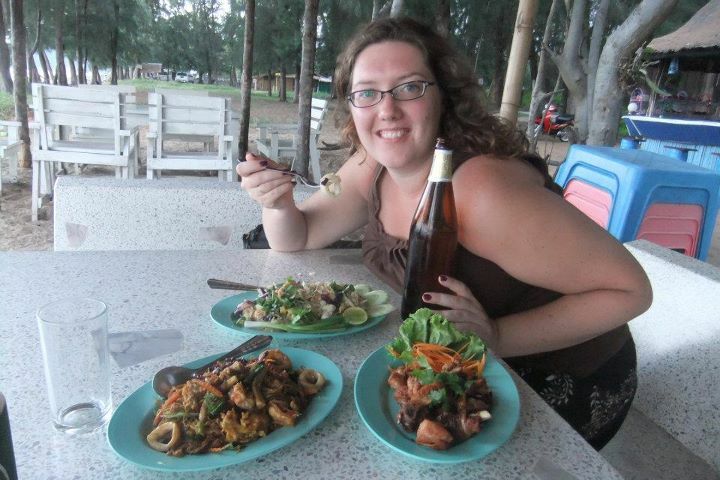 We ordered a bunch of Thai dishes (fresh seafood, of course!) and beer to wash them down while it rained around us. 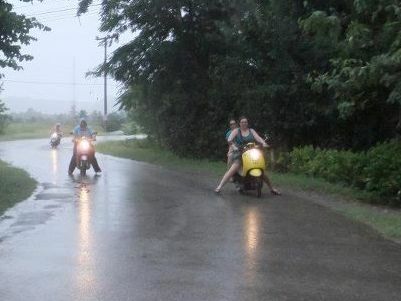 A new moped was delivered before we were done, and by the time the rain stopped we were ready to move on. We drove another 10km up the coast and stopped a second time. I walked in the water and watched a few little jellyfish fighting the tide. They didn’t seem to be winning. We saw a big storm blowing in to the south – the direction we’d be riding to get home. We drove off into the impending doom and were soon quite wet. We got more and more wet as we drove on. By the time we got back we were all drenched and jumped pretty much straight in the pool – which felt very warm by comparison! I stayed an extra night, along with one of the other girls. 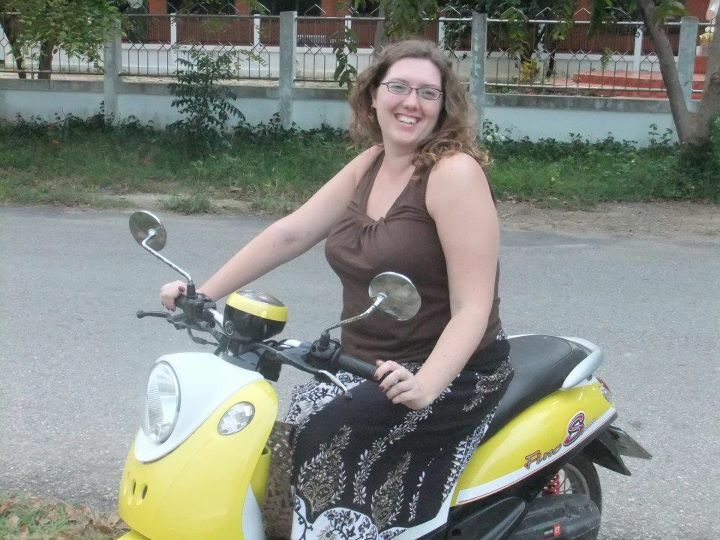 The two of us repeated the moped adventure the next day – fresh seafood and beer in a hut by a different beach, and driving into impending doom included. We didn’t get quite as wet, thanks to an icecream stop along the way that happened to coincide with the heaviest part of the downpour. Still, despite wringing my clothes out and hanging them up to dry they were still rather damp the next morning. My poor handbag still isn’t completely dry. Was totally worth it, of course. I love the feeling of driving down a mostly empty road, with the smells of salt and frangipani and occasionally eucalyptus in the air. There are several stands of gum trees along the road and in the rainstorm they released their fragrance – was wonderful! We saw baby puppies, a slow little tortoise, cows being herded by a man on motorbike, fields full of pineapple plants, and beach after beach after beach. I also can’t get over how many different shades of GREEN there are! Looking to a far-off hillside and seeing several clearly different green colours all mingled together – it’s beautiful.